Inspecting your sewer and drain system for damage is something most homeowners don’t worry about until there is a problem with their system. Sewer inspections are a good idea for Parma, Ohio homeowners who are looking to prevent unexpected plumbing mishaps from happening. Maybe you are purchasing a new home, or setting up a rental property or you just want a second opinion on your system. A sewer and drain camera inspection will help you determine what state your system is in. It’s not uncommon for trees roots to infiltrate your plumbing and cause buildups, or possibly a pipe has collapsed or broken and with a camera inspection we’ll be able to find it fast. “blue-vibrant” type=”square” icon=”lightbulb”]How Does a Tree Root Clog Your Sewer Line? Easy… Usually the root infiltrates through a tiny crack, hole or other point of entry in your drain. Once that tiny root is exposed to all the water in your sewer line, it branches out and quickly collects the debris coming down your line, thus an eventual clog. As the camera is fed into your sewer lines we can watch what it see’s (poor little guy!) on our monitor in real-time. You can watch as we quickly find your problem and advise you on how we can solve it without a ridiculous bill that so many plumbing companies are quick to lay on their customers with sewer and drain problems. 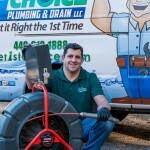 1st Choice Plumbing and Drain is a full service Parma, Ohio Plumber. We specialize in sewer and drain system inspections using our high-tech sewer inspection camera for both homes and businesses throughout Parma and the surrounding suburbs. Getting A Second Opinion On Your Plumbing Problem? 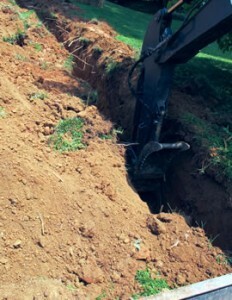 One of the reasons we are often called upon is to offer our services as a second opinion, usually for a home or business owner that has received a very large estimate ($10,000+) to repair their sewer system with an actual excavation of their sewer line. If a camera inspection has not been done yet, then you should demand one. Often, the work is not needed and is just the result of a plumbing contractor trying to turn a large profit at your expense. If you’re Googling this stuff right now then we certainly don’t need to tell you. With our sewer and drain camera inspection service we can tell you exactly what your problem is. 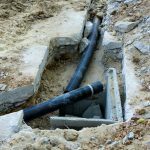 It may very well be a situation where you need to have the system excavated and if that’s the case there are still other options such as trenchless sewer repair, for which we can also help you. When you choose 1st Choice Plumbing and Drain you’ll have the confidence in knowing that whatever the problem is, is what the problem is. We won’t butter it up for you and rain down doom and gloom just to fill our pocketbook and we certainly won’t try and talk you into a quick fix that will only fail a short time in the future. We’re the plumbers that can fix your sewer and drain problems once and for all. 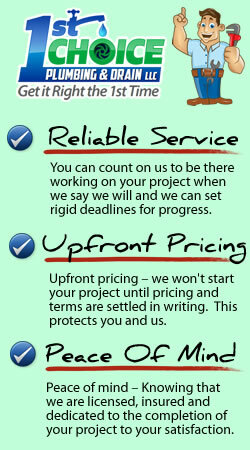 You want the truth about your plumbing system so you can make an educated decision and we can provide that for you. You’ll probably agree that it’s very stressful facing an astronomical plumbing bill that was seemingly unexpected. 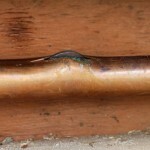 Most homeowners don’t have thousands of dollars laying around to fix a problem problem that may or may not be there. We understand this. If you’re in this situation right now then you need to give 1st Choice Plumbing and Drain a call today. We’ll promptly return your call and arrange a time to consult with you on your sewer problem and provide our sewer inspection service. It might very well be the case that we can save you thousands of dollars on your sewer repairs and save you from having to tear up your property (and your bank account! ).